Using this targeted coal and petroleum refining industries email list, you can make powerful connections with people whose products power our world. It's easy to download this accurate business contact list and start extracting value from it in just minutes! Don't let your business become a fossil in the world of fossil fuels. With our oil refinery and coal producer mailing list, you'll have a leg up on the competition because you won't have to waste time digging around for the direct contact information for crucial sales leads. Instead, you can buy this pre-built business database, download it, and get started marketing to important people in the fields of coal mining and petroleum refining right away. 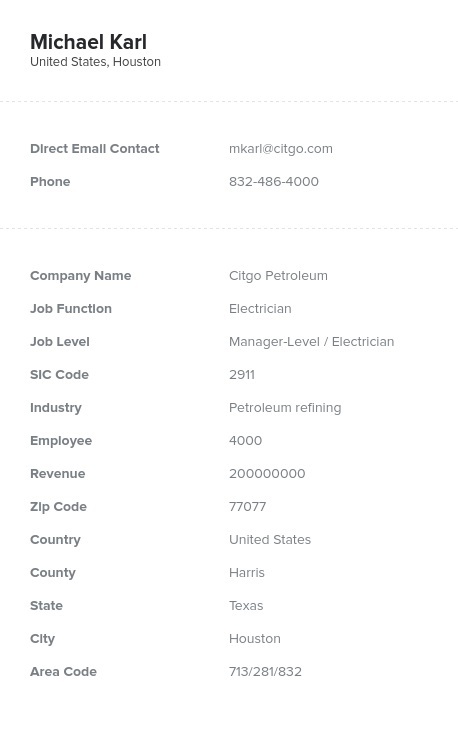 Let us make your marketing efforts simpler with this petroleum and coal products manufacturing email database and you'll have all of the contact information you could possibly need right at your fingertips. Arm your sales staff with real names, company information, email addresses, phone numbers, mailing addresses, and fax numbers of solid sales leads and leave your competitors in the dust. For a more targeted approach, you might also want to try out our list-builder tool. With it, you can extract just the right data for you, refining your email marketing list by location, company size, job title, and other factors. Then, download the file, import it into your CRM system, and pump up your bottom line! Whether you choose a custom B2B email list or this affordable coal and petroleum production email list, you'll be able to fire up your marketing efforts fast. Buy a business list from us and get results.